Adam Wilson specializes in utilizing digital modeling software, coupled with hands-on physical making, to explore the potential of an environment’s influence on the individual experience. He is currently working on a small renovation for Poling Hall at OSU, and worked on the SD package for Hood River Middle School. 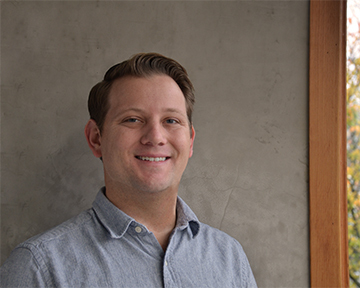 Prior to joining Opsis, Adam worked as an Architectural Designer and Digital Fabrication Specialist at several firms in the Pacific Northwest, including: Solterra, Rhiza A+D, and Lead Pencil Studio. These highly research-oriented and hands-on positions exposed him to a broad scope of design scales; from public art and exhibit design, to restaurant TIs and mid-rise mixed use projects. While the project type might vary, Adam always has a passion for creating unique human-centered environments. Adam earned his Master of Architecture from the University of Oregon Urban Architecture Program in Portland and his Bachelor of Science in Architecture from Arizona State University. He is currently working towards his architectural license and LEED accreditation. He is involved in the Architecture Foundation of Oregon’s Architects in the Schools program.